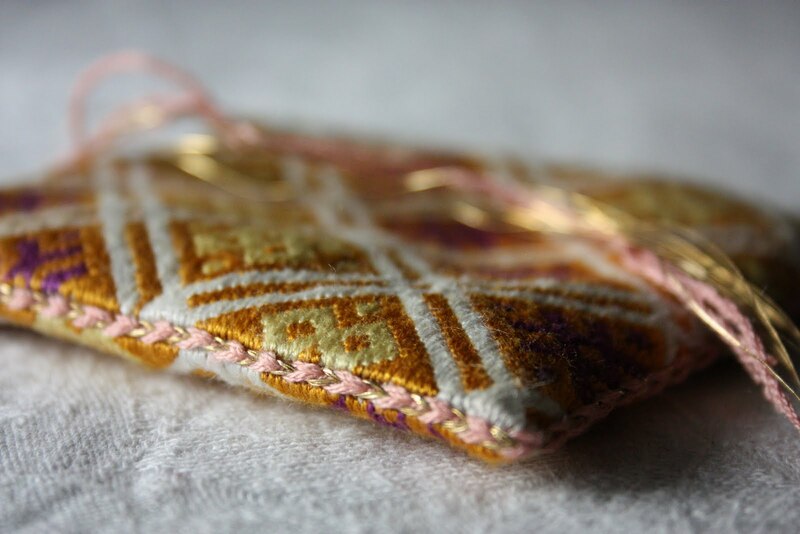 I'm finishing the seams of a pouch in pink silk and gold thread. It's slow work, and I still need to finish the seams at the top. I really like doing this type of embroidery, but I'm not always concentrated enough :-). I think chapter 3 of Nancy Spies' Ecclesiastical pomp and aristocratic circumstance is a nice basic introduction to the different types of metal thread that could be used in the Middle Ages. She gives quite a number of references, and she also included some interesting pictures. I must confess that the Benton & Johnson website is a bit of a mystery to me. Has anyone ordered there yet? Does anyone know if they have the type of thread I described above? I am not very knowledgable about thread construction, but Tricia at this blog is. I think she can answer questions about Benton and Johnson threads and if there are other sources of the spun gold thread you are interested in. Please, go introduce yourself. Benton and Johnson actually manufacture the threads so there is a good chance that you could send them a reference and ask what they make which is suitable for your purpose. Since you are looking for gold thread, I'll do a shameless plug here: I sell spun gold thread that was custom-made to my specifications which just happen to come directly from the graveyard finds of Villach-Judendorf in Austria and date to the 12th century. 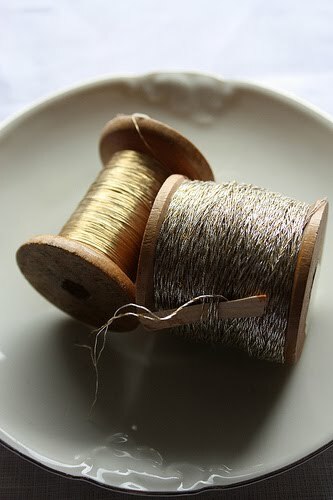 The thread is 0.2 mm thick (which was the most common thickness according to my studies of gold threads) and consists of an undyed core of real silk, wrapped with gilt fine silver. and you can also contact me via my website, http://www.pallia.net. Thanks for shamelessly plugging your wares:-) I'm sure we're not the only ones interested!